On the occasion of preparing 2017 Lunar New Year, on behalf of the Party Civil Affairs Committee, Leader of CEMA, I send the compliment and best wishes to cadres, officials in system of agencies doing ethnic tasks from the Central to local. 2016, along with enormous achievements of our country, ethnic tasks achieve some outstanding accomplishments: Government, the Prime Minister enacted crucial system of policies, supported the complete development in mountainous and ethnic minority area term 2016 – 2021; the Prime Minister decided to establish Ethnic Academy. Ethnic Academy is research institute, university where high-class cadres, officials in political system were educated about ethnic knowledge, making a contribution to the development of human resource in mountainous and ethnic minority area. Leaders of CEMA, Departments, units, National Broad in provinces, cities National Room in districts continue to change mindset, how to do things, stay close the current situation, be the counsellor to Party, Government, the authority in every level mobilizes the power of entire political system, do the ethnic tasks; take care the socio-economic development, solve well all social issues in mountainous and ethnic minority area. Therefore, the infrastructure in mountainous and ethnic minority area continues to be invested, people’s lives are non-stop improved contributing to people’s belief for Party, Government. Also, 2016 is a year that Agencies doing ethnic tasks successfully launched the 70th Traditional Day Anniversary. Through the Anniversary, we encourage cadres, officials in the system to promote the achieved results through 70 years build and develop, continue to complete political tasks in new term. Beside important achieved results, ethnic tasks also have inadequacy. Mountainous and ethnic minority area is still the slow development area, ethnic people’s lives have many difficulties, high poverty level, lack of jobs, low income; unusual natural disasters and diseases; the percentage of dropout students is high; some backward habits and customs were not repulsed. Those are big challenge requiring individuals doing ethnic tasks have to exert themselves more, overcome difficulties, execute the victorious millennium developing aim to ethnic minority people attached with sustainable development after 2015. 2017, our country stands before opportunity. Ethnic tasks have many advantages; however, we will face many challenges. I believe that our cadres, officials in system of agencies doing ethnic tasks will unite, active, creative, overcome difficulties; continue to do well counselling tasks, deploy efficient execution of ethnic policies which had been enacted; encourage other ethnic people to overcome difficulties, promote their ability along with Government support to economically develop, push back the hunger and poverty level, reach to better life. Together we will achieve the Resolution in the XII National’s Representatives Congress: “making clear change in economic, cultural and social development in area having lots of ethnic minority people, especially in Northwest area, Central Highland, Southwest area, western central Coastal Region, etc.”. 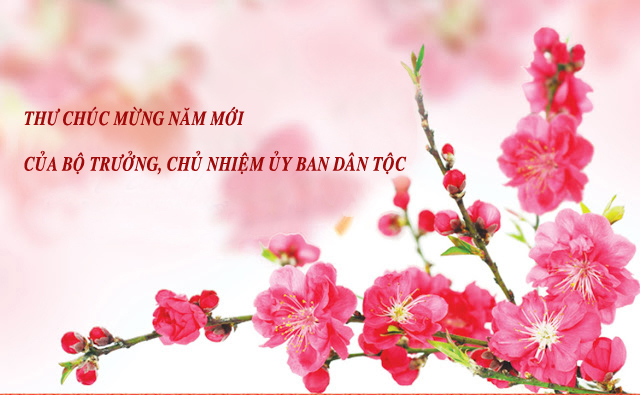 The glory of our Party, happy Lunar New Year 2017, on behalf of the Party Civil Affairs Committee, Leader of CEMA, I wish cadres, families and people in all ethnic groups inVietnam have health and lots of hapiness.